I have a weakness for Reese’s Peanut Butter Cups. They are one of my favorites! They are always my first candy that I search for in my boys Halloween candy and Christmas stockings. 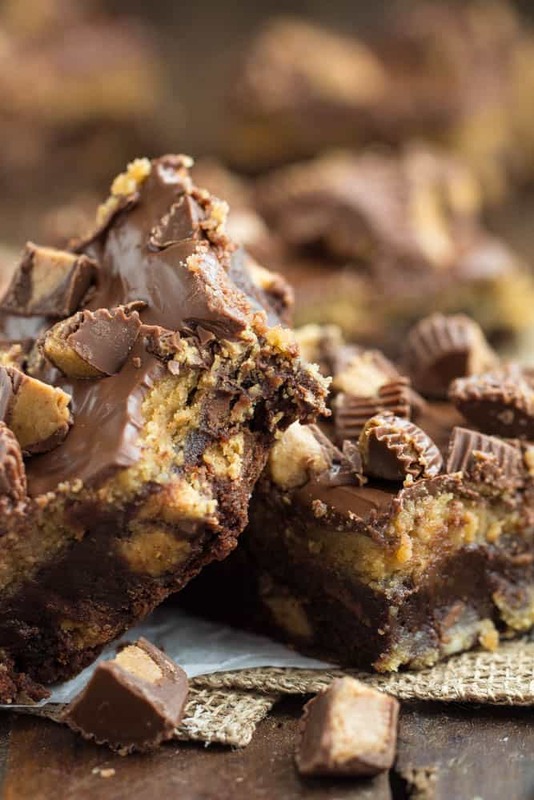 I even have Reese’s Peanut Butter Bars on the blog that are pure heaven. So if you are a Reese’s Peanut Butter Cup lover like I am, these need to happen in your life right now! These brownies have to be the best brownies that I have ever made. 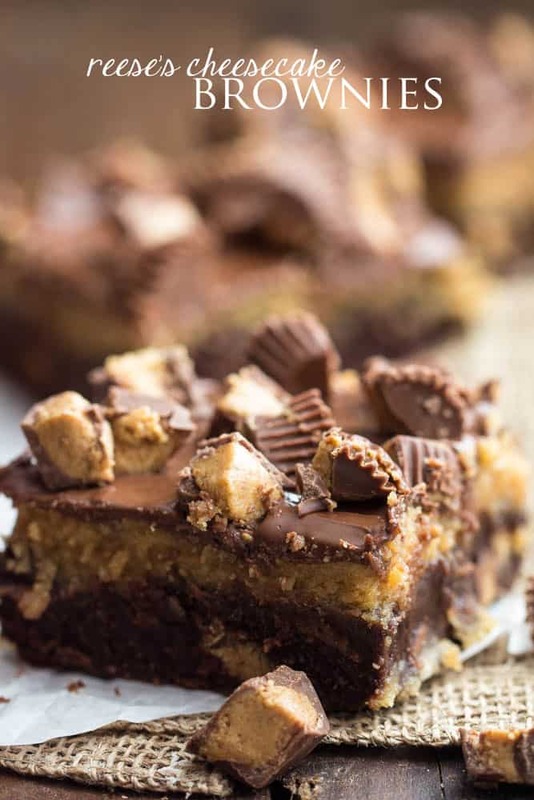 A rich and fudgy brownie layer stuffed with Reese’s Peanut Butter Cups inside. Then, a creamy peanut butter cheesecake layer topped with chocolate and more Reese’s Peanut butter Cups! Can you even imagine how mind blowing these are for your first bite? This is the ultimate Reese’s Lovers Brownie right here and something you need to experience! A Reese's Peanut Butter Cup heaven! A fudgy brownie stuffed with Reese's, a creamy peanut butter cheesecake layer and topped with chocolate! Amazing! Preheat your oven to 350 degrees. Line a 9x13 inch pan with aluminum foil for easy removal of the bars. Spray with cooking spray and set aside. Chop your reese's peanut butter cups into fourths and divide them in half. In a microwave safe bowl or using a double broiler, melt the ¾ cup of butter and chopped dark chocolate. Stirring ever 30 seconds being careful not to let the chocolate burn. Whisk sugar and brown sugar to the melted chocolate mixture. Then add the vanilla and eggs until it it is fully incorporated. Stir the flour until incorporated. Fold in half of the chopped Reese's Peanut butter cups. Pour this mixture into your prepared 9x13 inch pan. To make the cheesecake layer, in a stand mixer using the paddle attachment, cream together the cream cheese and softened butter about 2 minutes until fluffy. Mix in the egg, sugar, salt, and vanilla on high for another 2 minutes. Mix in the peanut butter for 2 minutes. Pour the cream cheese layer over the brownie layer and spread it out so that it is smooth on the top and completely covers the brownie layer. Bake for 35-40 minutes. The top and edges should be slightly golden and the center is set. Let the bars completely cool and refrigerate for at least an hour before the chocolate layer on top. To make the chocolate layer, in a microwave safe bowl, add the chocolate chips. Melt 30 seconds at a time until melted and smooth. Pour over the top of the peanut butter cheesecake layer and spread evenly. Sprinkle the rest of the chopped Reese's Peanut Butter Cups on top. Pop in the fridge until the chocolate is set. Cut into squares and serve. Your recipe looks amazing! I just wanted to make sure the recipie calls for cream cheese and not bream cheese? I guess bream cheese is a type of sea food. We are baking these brownies at this very moment! Very excited to try them out. One little thing I would say is to adjust the times at the top of the recipe, they are a little misleading. It would have helped me a lot if the total time reflected the cool, refrigeration, and chocolate setting time. We were going to make these yesterday, but realized almost too late after reading through the entire recipe that it was going to take hours instead of 55 minutes. Can’t wait to taste them! I just made these and the chocolate chip layer seems to want to keep separating from the cheesecake layers. I’m not sure what I could have done wrong as I thought I followed your recipe exactly. Any suggestions? It tastes delicious by the way… just falls apart… LOL! What exactly do you mean by ” Stir the flour until incorporated. Fold in half of the chopped Reese’s Peanut butter cups. .” After the mixture is made am i putting half the cut reeses into the mixture?